The tugging of grass right next to the tent woke me up in the morning. I look out and see a big herd of yaks all around. They graze peacefully. In the evening, when we were putting up our tents next to the river, herdsmen drove a herd of horses over the river close by our tent. And a herd of sheep and goats grazed by us at nightfall. The herdsmen stopped by and communicated with us on a very friendly note – they used their hands and feet; they don’t know any foreign language. The dogs from the nearby yurts first kept us away, but then they came to us and they lay close by our tent the entire night. So this is Mongolia! Mongolia, a country of never ending horizons, lots of herds of horses, semi-deserts, semi-green mountains and tremendously hospitable people. 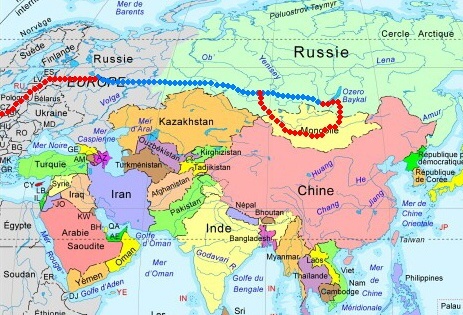 But it’s also a great distance to travel there through Russia. In Mongolia, there are no road signs, there are no proper maps, sometimes there’s no petrol, the towns are ugly remnants of Communism. But I’m not sure whether most people view the absence of asphalt, proper roads and road signs as a plus or a minus. For me it was definitely a plus. I spent several months preparing; the GPS points that Petr gave me helped me the most as did a detailed study and survey of various kinds of conferences on the Internet. I equipped myself with Soviet military maps that had already served the lads well and I left all maps that can be ordinarily bought in Europe at home – they’re worthless. I also agreed during the spring with friends from the Gazelle expedition team that we would travel together. They will take spare tires, extra oil and a few things for me. Gazelle is a Russian car similar to a Ford Transit, but on a high chassis and with a four-wheel drive. We bought train tickets from Moscow to Novosibirsk. I wanted to buy return tickets in Novosibirsk because I thought that they would be cheaper. What a pity! When we bought them in Novosibirsk, they were more than twice the price. I loaded my spare things into the Gazelle in the last week in June and we packed everything onto my motorbike so that we could survive without the Gazelle in case it didn’t make it to the rendezvous. I set out on my motorbike and passed through Poland, Lithuania and Latvia on my way to Moscow. Zdeňka flew in to Moscow two days later. It isn’t worth mentioning the two thousand kilometers on the road to Moscow; asphalt, rain, 4 hours on the Russian border – two and a half days on the road. In Moscow, we were taken in by our friends in the Czech House . On Monday morning, I made my rounds at the train station and begged and tried to convince the people there to load my motorbike onto the train. At the Yaroslavsky Rail Terminal, from where our train was to depart, I was in absolute despair. Everything was a problem. Nothing was possible. Everyone was unpleasant. Completely helpless I walked to the Kazansky Rail Terminal. An absolutely great Baggage Department Officer worked here. Nothing was a problem. The car leaves in the evening with the postal train. I took the subway to the Czech House and drove my motorbike through mad Russian traffic to the train station. They weighed it and of course tried to wriggle out of taking it on board because it was too heavy. I expected this and immediately offered to give them extra money and then everything was plain sailing. As a bonus I got the train conductor’s telephone number so that I could call him and ask when he would be arriving in Novosibirsk. I’m afraid that without a good knowledge of Russian, the battle would be lost before it even started. I just arranged things and then took the subway to the Airport to pick-up Zdeňka, who had just arrived. We did some sightseeing of the concrete beauties of Moscow. We had a relishing dinner with our hosts and in the evening we were on the train from Moscow to Novosibirsk. The train was very clean; Czech Railways are no match for Russian Railways. We arrived in Novosibirsk three days later. Here we were also surprised at how beautiful the train station was – it was clean, newly reconstructed and there was also a hotel. Czech Railways and the Prague Main Railway Station should be ashamed. I called the conductor and was told that they attached it to another train in Omsk and that it would be in an hour later. It really did arrive and along with it also my motorbike. We arrived in Gorno-Altaysk in the evening. A kind hotel owner accommodated us at night and we slept on the floor in the hall. The holidays had started and the hotel was completely full. Altay is exquisite; a solace after the hell in Moscow. We traveled on to the place where the people board at the merger of the Katun River below the highest mountain of Altay, the Belukha Mountain. A surprise awaited us here. As this area is borderland, it is newly under military control. They let us in without any problems but we were allowed out only with a permit. This permit is made up of two parts: the one must be issued by the police and the other by the soldiers. But the thing is that it was Saturday evening; the policemen were drunk and absolutely stupid. We were saved by the soldiers, who were very much at ease; in fact, the commander spoke English. They gave us our passes and called the post by radio and told them to let us through. A surprise awaited us in one of the villages. All the roads were made out of fine gravel, the road signs were rusty or riddled, but the police kept their eye on a 40 km/h speed limit. They had a manual radar (Iskra1), which Czech policemen could envy them for. Luckily, they were okay and they let us go. And then we finally met up with the Gazelle at the 52 Motorway (also known as the Chuya Highway or the Chuysky Trakt). We traveled the remaining 600 km to the Mongolian border together. We bought petrol, food and bottled water in the last village in front of the border. Needlessly; you can buy anything you need in Mongolia. Our crossing the border was difficult. We waited for three hours before we smooth-talked a woman, who let people pass on, into believing that we were an international expedition and she let us pass by the whole queue. The border is open only from 9 a.m. - 6 p.m.. They have an hour’s lunch-break, and it is closed another two or three days because of public holidays in Mongolia. So we were really lucky. The asphalt ends exactly at the dividing line between the two countries. The soldiers open a rusty iron gate in the fence and you drive from the asphalt directly onto a broken dirt road. We successfully passed the border after six hours. 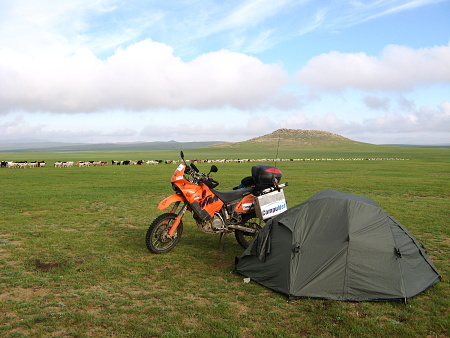 We really meet with the Mongolians for the fist time by the Dunb-Nur Lake, where we made camp. All of them love taking photos, adults and children alike and they are completely enchanted by being able to see the photos on the display. Next time, I will definitely bring a small printer with me and I’ll print the photos for them. I change the tires to cross-country Michelin Desert ones. The locals are terribly inquisitive; they touch everything; they sit on my motorbike, they press switches and pull levers and if their feet reached the ground they’d take my motorbike for a ride without asking. I wouldn’t be afraid; they were born on motorbikes and horses. A beautiful road led from the lake over the saddle to Ölgii. It seems that a road is already being built from the town towards the border. 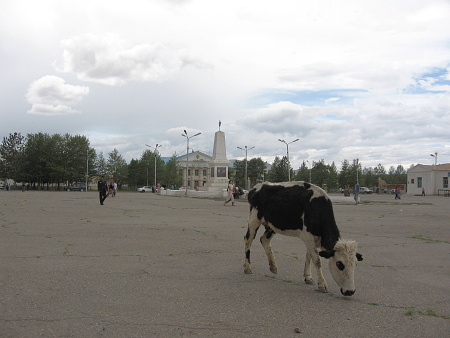 Ölgii is a great Mongolian town – you’ll find cows on the town square; a Mongolian drives up in front of the bank on his horse and leaves him tied on the street. We discover the Zoognyj Gazar (a local canteen). They serve delicious noodles, mutton and vegetables, potato salad and good mutton soup. It’s just the tea with milk and salt that we can’t handle. Later on, we discover that if we order Lipton Tea then we are served a completely normal cup of tea. Our knowledge of Cyrillic comes in very handy; Mongolia, in fact, also uses Cyrillic. We tried to continue in the direction of the Hurganuur Lake on the Kazakhstan border, but you have to have a permit if you want to enter any part of the area and these permits are issued in Ölgii. And tomorrow is a public holiday, so everything is closed. 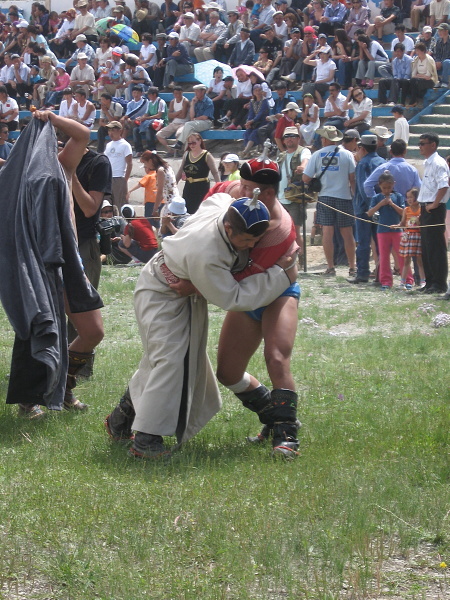 So, the next day, we at least go and have a look at the Naadam celebrations. The road from Ölgii is now a full-blooded desert. True, a lake pops up here and there, but the road is usually lined with black stone fields. We stop at a little house alongside the road where a family runs something like a snack-bar. We have their photos from Petr and so we give them to them. They are overjoyed. They treat us to tea and because they know that we don’t like tea with milk, they just give us tea. But salted. They are Kazakh and that’s the way they drink it. Whenever we met Kazakhs they always emphasized that they are not Mongolians . Perhaps they think their neighbors to be rather simple. 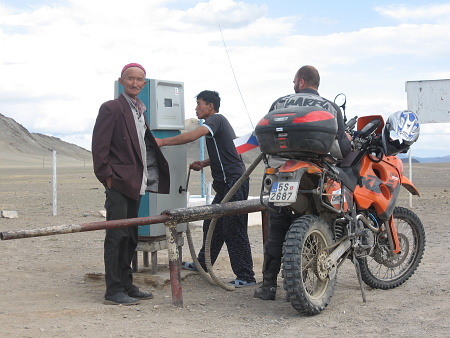 I refuel in Tolbo, a district of the Bayan-Ölgii Province. The petrol stand is driven by a handle and when I asked if they have 92, 80 or 76 octane petrol they replied that they have petrol. I suspect them of not being able to read. I wrote the numbers down for them on a piece of paper and nothing! It was 76 octane petrol. Luckily, my motorbike has a switching electronics ignition and so it doesn’t matter. The only difference is that consumption went up from the ordinary 5 liters to 7 liters. 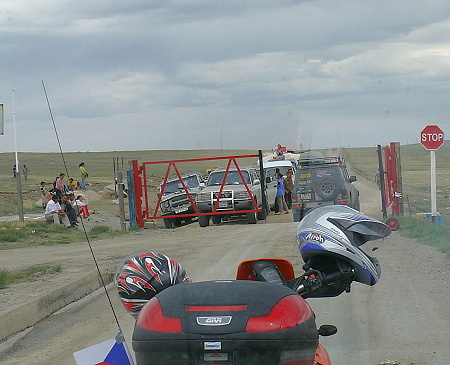 Once outside of Tolbo we try to turn away from the main road towards the Chinese border in the direction of Bulgan. The road leads beyond the crest of the Mongolian Altay, where the second highest mountain, Mönkh Khairkhan (4 362 m), lies. We keep on moving about in heights around 2 000-2 500 meters above sea level. It is the rain period, so it is rather overcast. Storms can be seen over the mountains and a few drops of rain fall on our heads now and then. 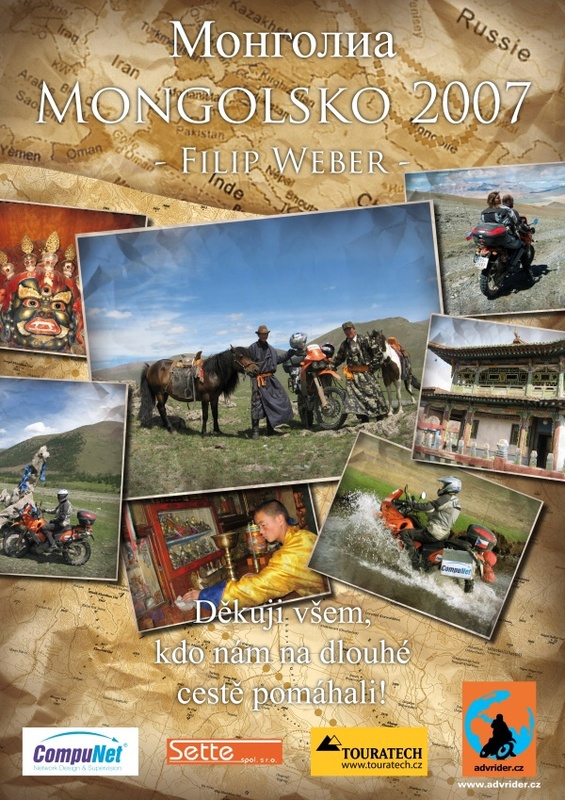 On the way to Deelun we meet two boys in the open country on an IŽ motorbike. They have a puncture. They have taken the tire off and removed it but they don’t have gluing. So I glue the tire tube and pump it up with a little pump. In Deelun, we search for diesel. They only have petrol at the filling stations (manual drive, of course). Then I ask a person who has trucks and a barrel of petrol on one of them. Trucks are petrol ZILs. He speaks a little Russian and Chinese and he advises us not to got in the direction of Bulgan; that the road leads through the canyon and that it is really very bad. And? We should travel in the direction of Khovd. The road is apparently good. We believe him and turn away onto the main road in the direction of Khovd. The road is not the best and the Gazelle inches forward like a snail. 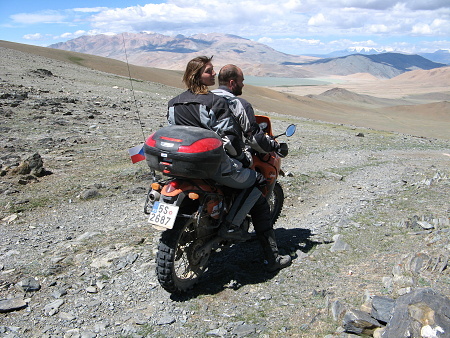 But the road leads over a magnificent saddle 2 630 meters above seal level with a breathtaking emerald lake. Once beyond the saddle, we visit the locals in a yurt. I’d almost believe that we were the first foreigners who passed this way. We join up to the main route between Ölgii and Khovd behind the ford. Don’t be deceived, the main route means that ten cars pass by here per day; the road has been cleared by a bulldozer in a rocky terrain. The road leads through a typical Sahara countryside right up to Khovd. I mean that kind of Sahara where there’s no sand but only a rocky desert – just rocks and stones. 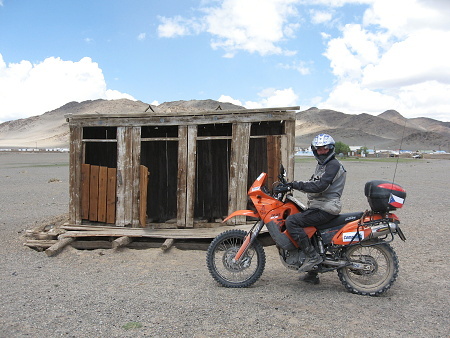 It’s extremely hot on the stone plain and so we make haste on our motorbike and we stop only when we get to Khovd at a river, where we make camp. Storms ravage the mountains around us all night long, but again only a few drops fall on us. 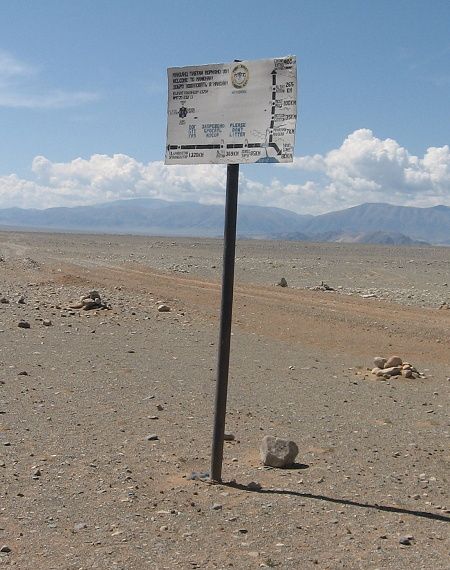 From Khovd we continue through the desert and then in the direction of the town of Altay. It is hot; the road is a stony shutter. We can travel either 10km/h or 90km/h. I of course go 90-100km/h, but sometimes cross tracks or big holes pop up and poor Zdeňka moans. We have lunch in the town of Darwi (I call it a town but it was five houses and ten yurts). They have a filling station here. All I had to do was find the pump woman and drive her to the filling station. The Gazelle catches up with us. We agree another rendezvous 200 km on. The thing is that the Gazelle is extremely slow and if we were to travel together, we would be standing and waiting all the time. It’s always better to wait for them a few hundred kilometers on and to roll about. The road is still a stony shutter and we are surrounded by huge plains full of stones. A huge storm is catching up on us. We can see lightning and uplifted dust in the distance. At the rendezvous we wait until it gets dark but the Gazelle doesn’t show up. The storm is getting closer and closer. Rather than risk sleeping without a tent in the desert when the storm comes, I decide, when it gets dark, that we will leave for a hotel point that I have prepared in my GPS. It’s in Altay, a crow-fly distance of about 50km. Try traveling at night through the desert on a motorbike with lights adjusted to suit the road and you’ll soon find out that it’s an ugly experience. 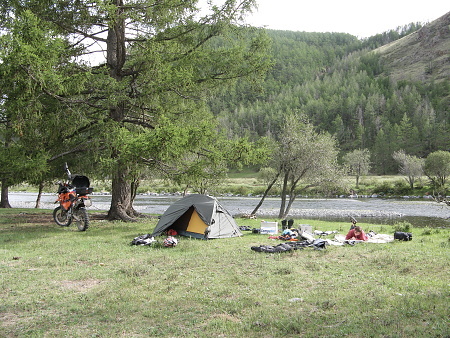 After about 70 km, we finally arrive at Altay. But even though we are just a kilometer away from the town, Zdeňka doesn’t believe me when I tell her that there’s a town ahead of us. The town doesn’t glow at all; not even the houses or the streets. Only when we are amidst the houses does a window or two light up now and then. According to my GPS, we are standing right next to the hotel but we can’t see anything, so we try asking passers-by. They are afraid of us and runaway. Then we were probably overheard by some police officers. They came out from the dark in white uniforms and with a smile on their faces took us around to the other side of the building in front of which we were standing. It was the hotel. They parked my motorbike in the police garage, the door of which was lined with sheep skin. The winter is really tough here. The room was luxurious – it had two beds, plush little mufflers with teddy bears and a toilet that probably no-one cleans. But we got clean bed-clothes and we fell asleep dead-tired. If you are surprised that we entrusted our things to the Gazelle then try crossing the desert in two with suitcases. But after this happened, we always traveled carrying all our things. In the morning, we did some sightseeing in the town. Something so disgusting could have stayed here only after the Communists. The local hospital was the first hospital in the world that made me dread any possible stay there. We had a delicious lunch at the local canteen and the Gazelle turned up after lunch. The support of the condenser ruptured on the terrible shutters and they punctured the condenser. They could do nothing else but solder up the condenser for the rest of the day and so we also changed the oil in my motorbike. In the evening, we finally set out on another journey. 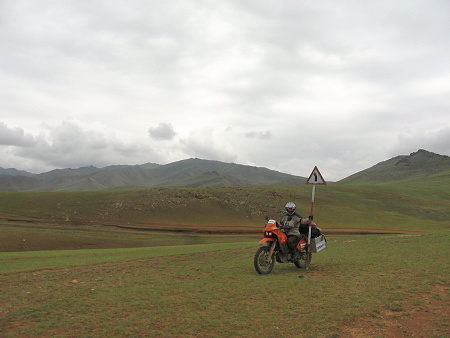 First, we passed by green plains and found many beaten tracks. Then the countryside again slowly turns into a stony desert and we drive into the northern part of the Gobi desert. On the way we meet a car with a punctured tire. Two young girls and a younger brother were traveling in it from Ulaanbaatar to Khovd. The didn’t have a spare tire so the brother takes the wheel into his arms and I drive him 15 km to the village on the horizon where they might help him. 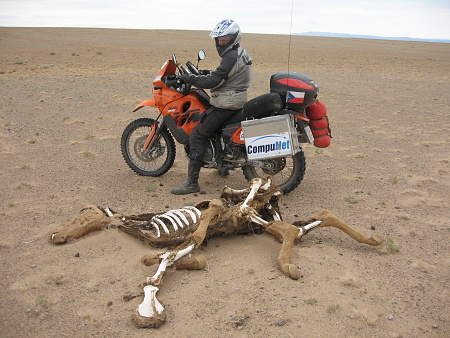 Even though he was a Mongolian, he searched long and hard for the repair center and in the end we left him there as he said he would drive back by himself. We again meet up with the Gazelle in Delger. 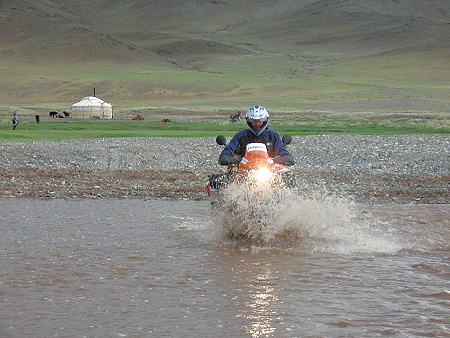 Our next journey is plotted in the maps more north, but the locals send us southwards to Gobi. The road really takes us very much south to the desert, almost to Chandmani. During the entire day we only meet two trucks, but they travel far away from us. Somewhere in Gobi the map flew away from my tank and we go on just following the data in my GPS. It appears to us that we are traveling too much southwards. We check the routes in the Soviet military maps and it was again confirmed that these are the only right maps for Mongolia. We are going in the right direction. This is a better route. The northern route leads over mountains that are 2 200 above see level. What is nice is that springs are plotted in the maps along with information about the water yield in liters/hour. The maps are of course drawn up in Cyrillic, so they are worthless for Englishmen or Germans. We are lucky; the desert is overcast and we guess there’s a real downpour over the mountains in the distance. It sometimes rains slightly in the desert and that’s why it’s not so terribly hot and we drive happily on. 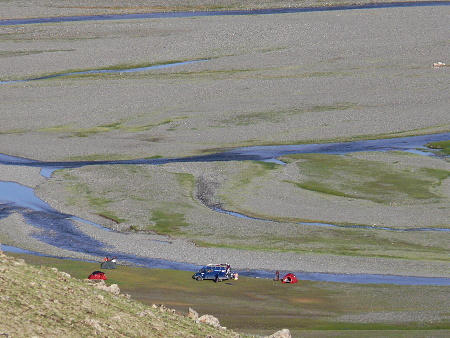 In the evening on the dividing line between Gobi and the mountains we arrive at the famous ford, where last year two travelers drowned their BMWs independently from each other – they sucked up water into the cylinders. I go through the ford there and back and there and back. All you need to do is find the right place to cross. The Baydrag Gol River runs from the mountains to the north to Gobi and there it disappears in the desert. We arrive at the bridge on the main road at night. It is made out of wood and stands proud to a sign saying “3t” and overloaded ZILs with huge trailers pass over it without any hassle. With the bridge behind us, we pass by a local gold-bearing deposit – poor yurts or tents; people rake the gravel and filter it in hope of profit. Bayankhongor comes across to us as civilization – restaurants, a bank, a market place, a theatre and they even have 93 octane petrol. Zdeňka tries to buy some medicine at the local drugstore to replenish the provisions that she lost in the desert. She, of course, does not succeed – she writes it all down in Roman letters, Cyrillic; she even tries Latin, but they don’t understand anything. But they willing let her have a look what they actually have – aspirin and plasters. We have a great lunch and drive off to have a look at the sulphurous hot springs in Shargaljut. There was probably a really big storm in the mountains yesterday. The road to Shargaljut is in many places carried away or covered with mud and stones from the hillsides. Shargaljut, just like all the other Mongolian significant places mentioned in guidebooks, is not worth the effort. The hillside with the sulphurous hot springs is full of people; we didn’t manage to get a soak; everyone speaks only Mongolian. We didn’t like it there. We return to Bayankhongor and find out that, fortunately for us, the Gazelle gave up moving on right at the start. It even took us 2.5 hours to cover the 70 km distance on motorbike. In Bayankhongor we turn away from the main route in the direction of Ulaanbaatar and we drive past the valley over the mountain crest to Tsetserleg. The road is really baking! It leads through the river valley over alluvial land made up of round pebbles and it transforms through many fords into a winding river. The pebbles in the fords are covered with algae and lie about randomly. 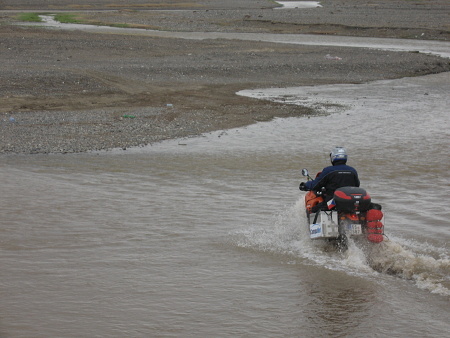 Crossing with a motorbike is really very hard. Once I roll in the river and I had to jump off my motorbike several times and ask Zdeňka to help me push it onto the bank. Zdeňka and I have a good indicator to help us identify what we like. As soon as a sisal or a marmot appears alongside the road, then it’s right. There weren’t any in the desert and as soon as we start climbing up into the mountains they start to appear. There are many of them; we see them in and around the road sitting up on their hind legs and looking around. They run over the road and sometimes even jump in front of my motorbike. Eagles circle above the plains and they keep a watchful eye on them. We pass by the monastery and Erdenetsogt and put up tent next to a beautifully clean pool that we can swim and wash in. Finally! After four long days! We wash our clothes and the air filter. We repack our things and rest. A mother and her little girl came to us from a near-by yurt and the little girl told us in lovely English that she welcomes us to Mongolia and that she brought us genuine Mongolian yoghurt. She gave us a whole bottle full of it and we gave it as it was to our friends from the Gazelle. They arrived at nightfall. They still tried to have a look at the monastery, but they weren’t let in. 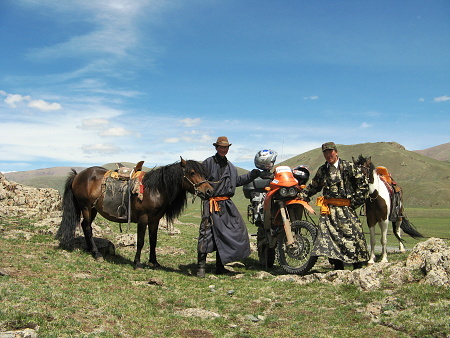 Several Mongolian passers-by look in on us in the evening; on horse, on motorbike, but also two on a motorbike with a billy-goat in their arms. In the morning, we visit the neighboring family in their yurt and return the bottle from the yoghurt. We also give them some small presents the Gazelle carried. In the monastery, we give them a photo from Petr for a change. They are again very glad, even if the specific person from the photograph is not there. But the others recognize him and so they open up their doors to us and let us in and we can have a look around the monastery as much as we like. We liked this monastery the most out of all the monasteries that we had visited. The countryside past the saddle is very green and finally bigger forests appear. We put up camp at a wonderful place by the river under the pine trees. We catch fish. We light a campfire. The only thing missing is a guitar. In the morning, the Gazelle leaves earlier and so we continue on our own. In my GPS I notice that, two years ago, the lads had turned sharply up in one place to the crest and that they then went on through the near-by valley. It’s not so easy – there’s going to be a real big ford here. There was. A wide deep river with a pebble bottom. I follow the lad’s route and so we come down to Tsetserleg from the hills from the other side. We met a Belgian couple in the hills. They trudged the ground with backpacks and looked on us as if we were extraterrestrial. Tsetserleg is again a hideous town. They have some sort of monastery here, which they are currently redoing. Nothing nice. 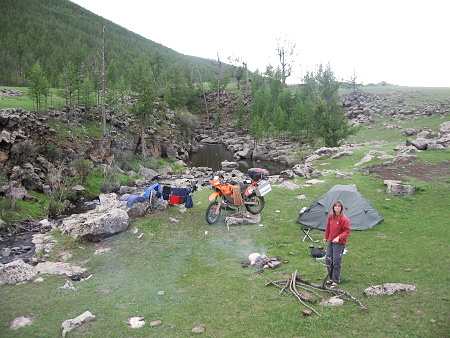 So we eat and immediately continue on our way to Charchorin, where we turn towards the Orkhon river valley. We sleep by the river. Horses graze around us. Another herd of horses are driven across the river in the dark and then a huge herd of goats crosses the river. Very romantic. Do you know why they have so many horses? Because they eat them in the winter! 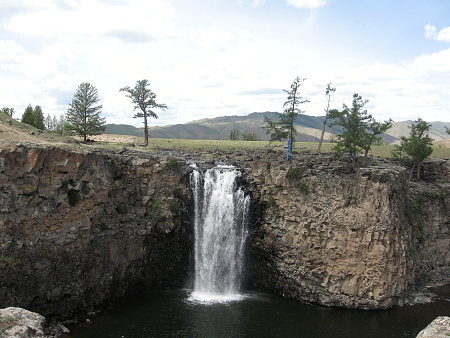 The biggest attraction here is the Orkhon waterfall. The Orkhon River is sliced into a sharp volcanic canyon and the Orkhon waterfall originated on the tributary which falls down 13 m into the river canyon. We’re lucky. It rained and so we have water. It is very often dry. 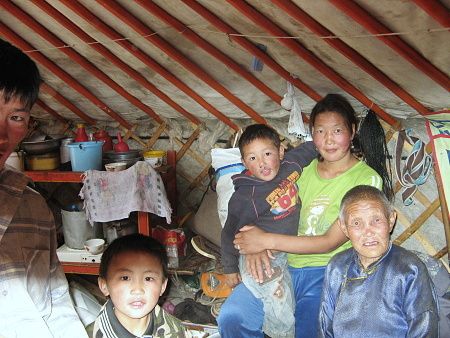 Many Mongolian families live on the plains around the canyon of the Orkhon Canyon with their herds. I had more photographs, but because the families move, we couldn’t find the people on the photographs. But they recognized them in one of the yurts and so we left the photographs with them. We made camp not far above the yurts. We washed in a small stream. I tried to catch fish and we relished the splendid countryside surrounding us. The next day we borrowed a horse from a near-by yurt and we made a short trip to the near-by forest. There were actually even wooden houses there. A freshly flayed wolf skin hanged from near-by one of them. Apparently , wolf packs represent a great danger for the locals in the winter. When we return the horse, a photographic craze breaks out in the yurts. Everyone wants to have their picture taken with everyone and I soon get bored and leave them the camera to have fun with and go out to see how the lads are riding on my motorbike. True, they can’t reach the ground, but they’re very smart and they soon find a way how to arrange things. Mongolian peoples loves photos to much. We spent a wonderful day here with amazing people! They treated us to cheese, milk and Airak (a slightly alcoholic beverage made out of mare milk). On our way out of the valley we came across an eagle family. Two adults and one youngster sat next to the road. I rode up to 10 m from them and only when Zdeňka started taking pictures of them did they start to run heavily and fly a little way on. I never saw such big birds in my life before. 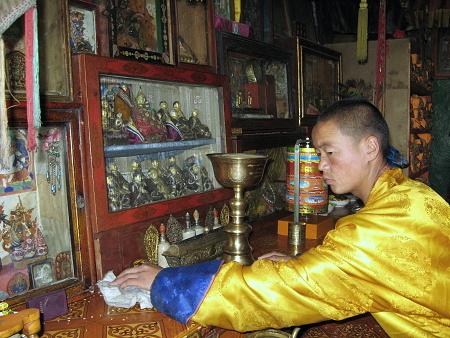 In Tsetserleg we undergo a compulsory visit of the largest monastery in Mongolia. Well, it’s nothing extra; it’s better up in the mountains. We leave the town behind us and take the main road a piece of which is in fact made out of asphalt. But beyond the town it turns into something like a motorway and I turn in the wrong direction and there’s nothing left for us to do than to stop a car that passes by and to try and ask for directions. The people in the car are very polite. The lady speaks Russian, the little girl speaks English and the gentleman knows where he is. So they lead us through the evening and heavy rain through the Mongolian mountains about 70 km up to an asphalt road that lies between Arwajcher and Ulaanbaatar. In the morning, we road onto a beautiful asphalt road and sped on to the northwest. But the asphalt ended after about 60 km. The Mongolians used their clever heads to think up a plan: They decided to reconstruct the entire road. And because they underwent training in Russia, where everything is big and proper, they dug up at once the entire 200 km long road. They ploughed it up and started to build everywhere at the same time. Drive where you want. So, at times we milled about excavators, at other times we drove through dusty steppes and the road was somewhere in a near-by valley. There were many cars everywhere as were huge black clouds of dust. We arrived at Ulaanbaatar totally exhausted after a five-hour drive. We got lost here and after driving about the town nonsensically for about an hour we finally found our way out of it and drove in the direction of the Russian border. Ulaanbaatar is hideous; there are prefabs along one road. It didn’t even occur to us to do some sightseeing. The road to the border is great - beautiful asphalt and low traffic. We crossed the border without any problems. A Russian man, who spoke a little Czech, amused us a lot. He served in the army in our country and he had a Czech lion and the sign “ČSSR” tattooed on his forearm! 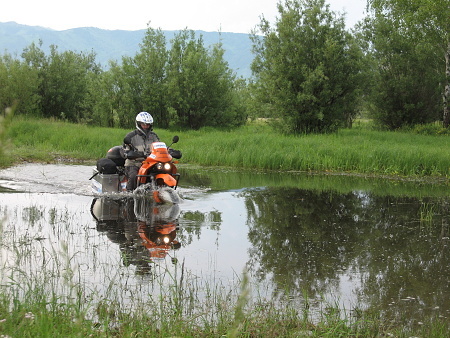 We had a great swim at the Baikal Lake and we loaded my motorbike onto a train in Irkutsk. It was loaded onto the train without any problems. The people in Siberia are normal. The only thing we had to do was that we had to hammer the motorbike into a frame because the cars travel empty to Moscow and so it would not be possible to encase it with luggage and it would fall at the very first switch. Zdeňka took the plane from Moscow and I arrived home two and a half days later. Zdeňka – For having excellently survived it all without rambling and for being in a good mood all the time! And I would also like to thank everyone else who helped us, even those of you who just kept your fingers crossed and wished us luck.